Always available in an emergency. 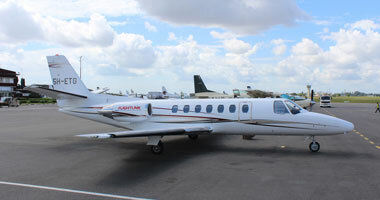 The Citation 560 jet is configured to deliver Air Ambulance services. 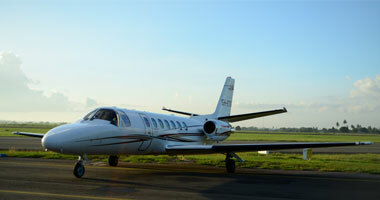 It is fitted with Pratt & Whitney Twin Jet Turbofan Engines with a Range of 1700 nautical miles. – Top speed of 800 kph with Flying Service Ceiling of 41,000 feet. 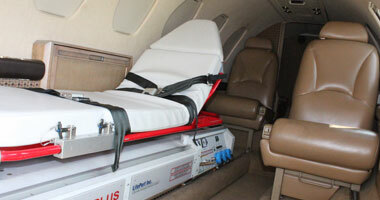 – With Medevac stretcher laid out, it seats an additional 5 people. – The Life Port System & Stretcher is equipped with Life Port Plus Aero Sled patient loading utility system with base unit that contains oxygen, compressed air pump, vacuum pump, and electrical inverter. – A qualified Cardiac Life Support Paramedic (ACLS) and an ICU nurse are available on Medevac. – Other facilities include – Telephone, a forward beverage station and a flushable toilet at the rear of the cabin. 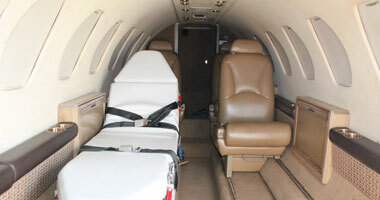 Flightlink Medevac team is on call 24/7.